Cancer care is a complex field, and the number of cancer patients is projected to increase substantially. Cancer care is a complex and demanding field, and the number of cancer patients is projected to increase substantially in coming decades. To meet the challenge, the Institute of Medicine in 2013 recommended that a high quality delivery system for cancer care be patient-centered. This is the underlying philosophy behind the ThedaCare Regional Cancer Center, in Appleton, WI, an 84,000 square-foot facility that offers some of the most advanced cancer treatments and therapies available. 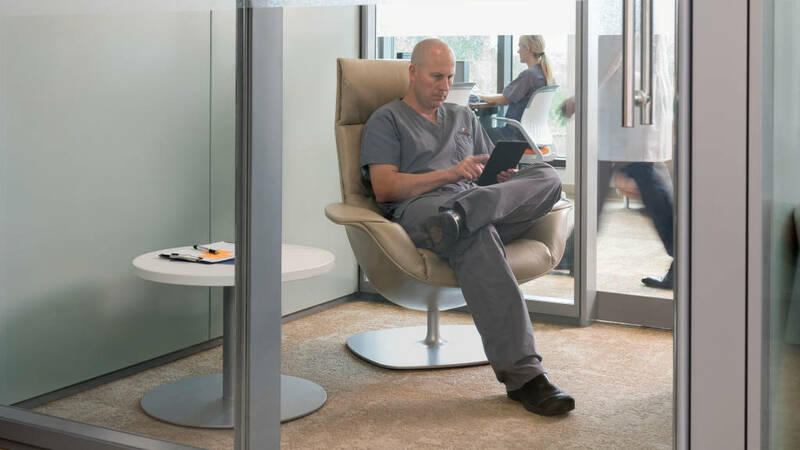 To address this challenge ThedaCare created an ecosystem of spaces that promotes the collaboration the staff requires without sacrificing the need for privacy and focus. Patients first meet their care providers in an unusually large, 170 square-foot exam room. Here, five to seven people, including patient and care partners, physician, nurse, and others, can meet comfortably. Seating and tables can be moved or removed to accommodate, say, a larger wheelchair or a different room configuration. The exam room hallways connect to the key workspace for the cancer center’s clinicians: a large team space covering half the first floor, with a range of settings for the varied work processes of the ThedaCare staff. 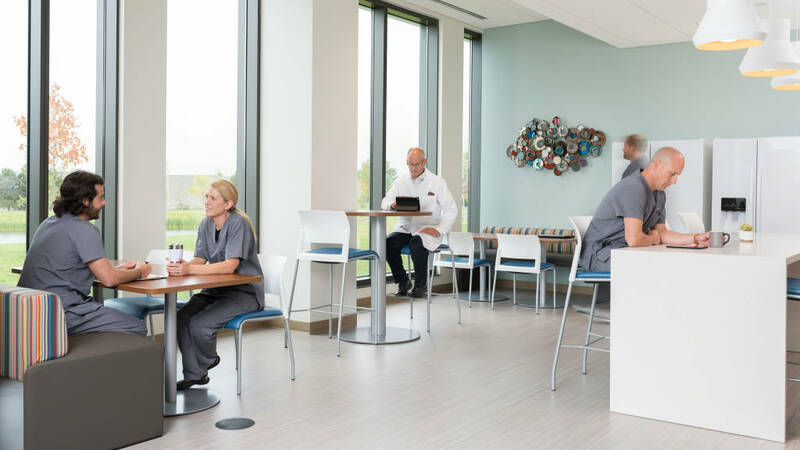 In this open floorplan, Sync clinician workstations provide multiple worksurfaces for technology and information support, and frequent collaboration, with Series Bench height adjustable workstations for nurses and nurse practitioners, schedulers, patient navigators and other staff. Every workstation includes a pair of adjustable flat screen monitors to access patient’s digital medical records. In the center of this team space is a meeting and discussion area formed by individual V.I.A. walls. Doctors, nurses and other clinicians gather here around stand-up height tables and use large flat screens built into V.I.A. as they review and discuss charts, test results and other content. Each corner of this central space also offers a sit down workspace with a desktop computer, microscope, or a pair of monitors, for additional individual or small group work sessions. In the middle of these four workspaces, lounge seating supports team discussions. A large team space designed to promote much needed collaboration among the ThedaCare staff encompasses half the first floor. This space provides a range of settings for the varied work processes of the ThedaCare staff. 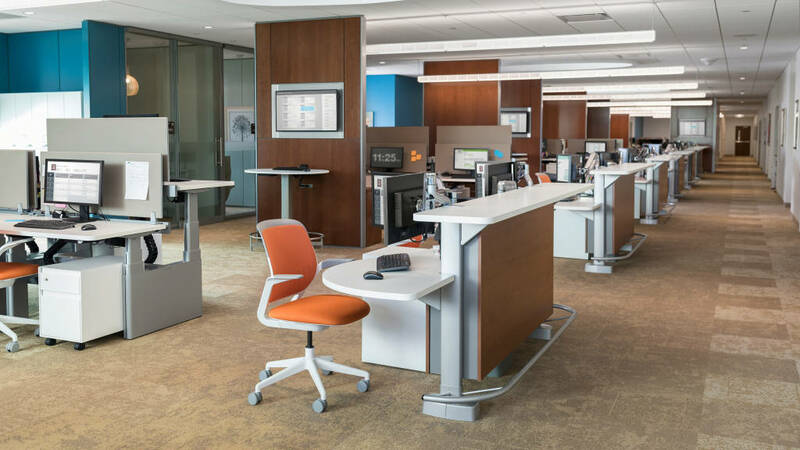 In the open floorplan, Sync clinician workstations provide multiple worksurfaces for technology and information support, and frequent collaboration, with Series Bench height adjustable workstations for nurses and nurse practitioners, schedulers, patient navigators and other staff. Communication in this half-floor space is continual, as is collaboration. ThedaCare professionals are constantly conferring, holding meetings in pairs, threes and fours. A nursing supervisor holds a daily staff meeting with no need for a conference room; she simply meets amid her team’s open workspaces. Nearby, a scheduler, medical assistant and nurse discuss a patient with special scheduling needs. Physicians lead stand-up consultations with nurses and other staff. A continual hum of quiet, professional teamwork pervades the floor. “This floor is the work engine of the clinic,” says Keith Novenski, cancer care project lead. “Staff can sit or stand. Nomadic workers not tied to a particular unit or area, such as social workers, physical therapists, dietitians and others, can use workstations for individual work or to meet with someone on the unit for a quick discussion,” says Novenski. “When I need to talk about a case, I just walk out to one of those standing tables. We have the monitor, we bring it up, we look at the scans, we talk. It really works well,” says Michael Ray, M.D., radiation oncologist. “The space works phenomenally well. Being able to see someone quickly, talk to them on the spur of the moment. That sort of organic connection and communication makes us all smarter, all better at caring for patients,” says Ray. The space also includes private spaces for individual focus, quiet and concentration. Effective caregiving requires places for individual focus, quiet and concentration, too. “If I’m seeing patients from the beginning of the day until the last patients at two o’clock, I’ll be in this open area. Then I need to retreat back to my individual workspace for the last two or three hours of the day. It’s nice to still have a place to really focus and to have privacy for patient calls,” says Ebben. Dr. Sjak-Shie points out that “most of us need to have some quiet time to focus and really think about a patient. It takes a little bit of downtime to really reflect and look at things. ThedaCare drew inspiration for the new center from both internal and external sources. They enlisted staff to test concepts before laying out the collaborative area. “We went through day-in-the-life exercises with physicians, nurses and other clinical specialists. We learned how this collection of spaces could work, how it could give people places to do different things: take a call, have a private conversation or use a microscope to view a slide, have an impromptu meeting. There are open line of sight across the space so you can see if someone’s there and meet with them immediately,” says Novenski. A cafe provides spaces where staff can connect socially or connect for informal meetings. “Seeing how Steelcase created collaborative spaces in their own building really challenged our thinking and helped us see how they would work in our community,” says Novenski. Physicians, hospital administrators and healthcare executives from the around the world have visited the ThedaCare cancer center to learn from the approach taken here. Novenski receives more requests for such visits each week. Most important are the approximately 200 patients who pass through the new cancer center each day. ThedaCare works to provide state of the art, personalized care for each one, and the new building helps them fulfill that mission. “The historical model was each doctor operated in kind of a silo. Patients would be carried and transported from silo to silo. Bring those silos together so that they can all work together on an individual patient has always been a bit of a challenge,” says Dr. Ray. 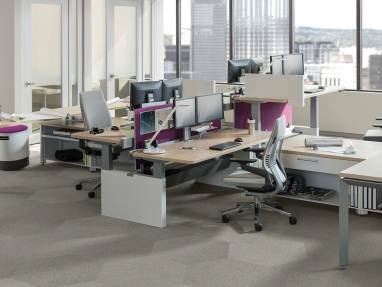 Private offices provide the staff with a space to do focused work. The offices are grouped together for easy communication. Front walls are mostly glass to make it easy to see if a colleague is in for a quick conversation. 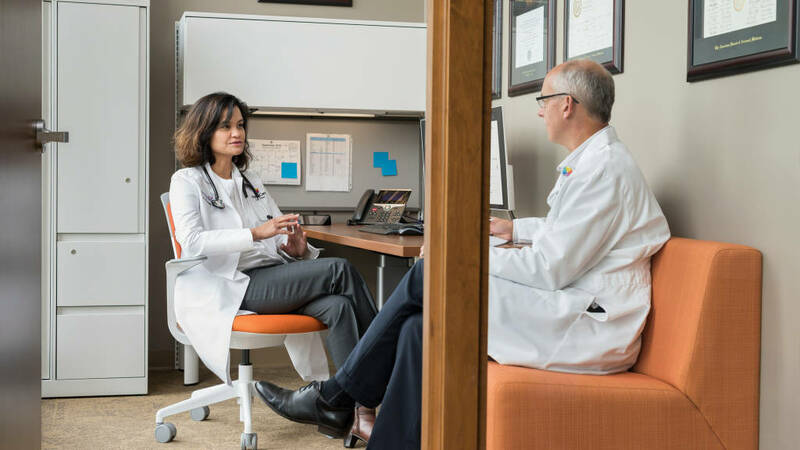 As healthcare organizations rethink work processes and workspaces, the physician’s office is often a touchy subject. For generations, doctors occupied large private offices of traditional drywall construction, with a big desk and credenza, spacious bookshelves, and often other tools as well, such as a microscope, x-ray view box or other equipment. A side chair worked for the occasional visitor, but sharing information, let alone collaboration, was not easy. As in so many other fields, real estate as status symbol seemed more important than a better work process. Technology and times have changed. Digital information, the internet, videoconferencing and a more collaborative approach to healthcare have changed the work processes of these highly skilled professionals. Now their workspaces are starting to reflect these changes. ThedaCare is a good example. Staff physicians have small (6′ X 9′) offices, with enough room for a desk, dual monitors, visitor chair and some paper files (patient medical records here are digital). What the offices lack in square footage, though, they more than make up for in function. The offices are grouped together for easy communication. 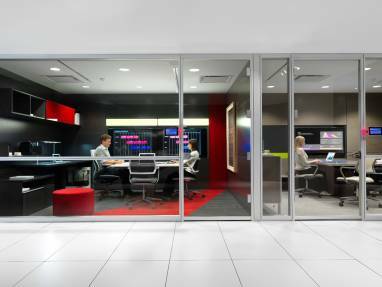 Front walls are mostly glass to make it easy to see if a colleague is in for a quick conversation. Michael Ray, M.D., a radiation oncologist, values this new approach to the physician’s office. “At the end of the day I need a space where I can go, sit down, collect some written materials, and have a space where I can centralize my thoughts, my communications, my documentation.